We didn’t think sourdough could get any better until Master Baker Fernando Padilla presented us with the first taste of this chocolate raisin baguette. 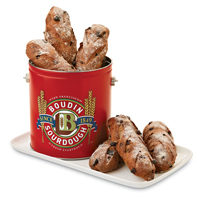 This delicious bread combines the tangy flavor of our sourdough with the sweet tastes of dark chocolate and plump raisins for a delicacy that is simply unforgettable. 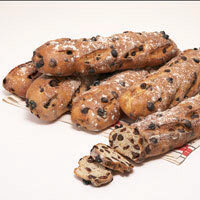 Includes: 6 Chocolate Raisin Sourdough Baguettes. From Tatiana Hendricks of Visalia, California on 4/14/2018 . From Anonymous of Greensburg, Pennsylvania on 3/2/2018 . From Esther Wheeler of Lakewood, California on 12/22/2017 . From Dolores Trimarco of Lansdale, Prince Edward Island on 12/8/2017 . From Bernard Jasmin of Naples, Florida on 9/2/2017 . From D. Brown of San Francisco, California on 6/6/2017 .